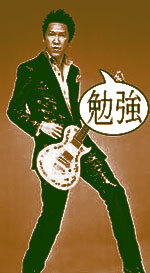 Hotei began as the guitarist for legendary rock group Boowy, featuring vocalist Himuro Kyosuke. After their breakup in 1987, Hotei decided to start out on a solo career. He's been highly successful ever since, most recently with his song featured in the soundtrack to the movie "Kill Bill", "Battle Without Honor or Humanity". This song has also been featured in many American commercials for various shows and items, and is the official theme song of Japanese slugger Matsui Hideki, who plays for the New York Yankees. Hotei has also starred in a Samurai film entitled "Samurai Fiction", for which he also wrote the soundtrack. From 1989 to 1991, Hotei was also in a group called "Complex", featuring well known rock vocalist Kikkawa Kouji. Hotei has also been married twice, both to women of note. His first wife was rock singer Yamashita Kumiko, his second (and current) wife is Imai Miki (a famous pop singer), whom he married in 1999.